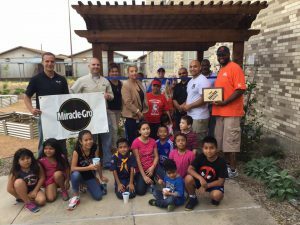 On September 24th, 2016 we celebrated the grand opening of the Herbert Marcus Elementary – Dallas Police Activities League self sustaining garden. Special thanks to Texas A&M AgriLife, Scott’s – Miracle Gro, the Home Depot, and the Dallas Police Youth Foundation for working together so we can make this garden possible. Without them this beautiful garden would never have been possible. I am certain we will awaken the love for nature in many young minds. Thanks also to the kids and parents who attended and helped plant all the vegetables.